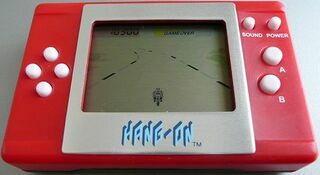 The LCD version of Hang-On (ハングオン) is an handheld game developed by Handheld Ltd.. It was distributed by Epoch in 2006 as part of the EL-SPIRITS Retro series. It is based on the arcade game, Hang-On. Another "port" exists as Electronic Hang-On.